1Place flour in bowl, add NUTTELEX and rub into flour using fingertips. (Mixture should look like bread crumbs). 2Add all of the milk at once and mix lightly to form a soft dough. 3Turn onto a lightly floured board and knead with fingertips until smooth (approx. 10–15 times). 4Roll out 2cm thick and cut into 12 pieces using a cutter or knife. 5Brush tops of scones with extra milk. Place on an ungreased baking tray and bake at 220°C for 10–15 minutes, or until sides of scones are set and tops are golden brown. 1Wholemeal scones — Follow the basic recipe substituting wholemeal self–raising for white flour and increase milk to 1 cup. 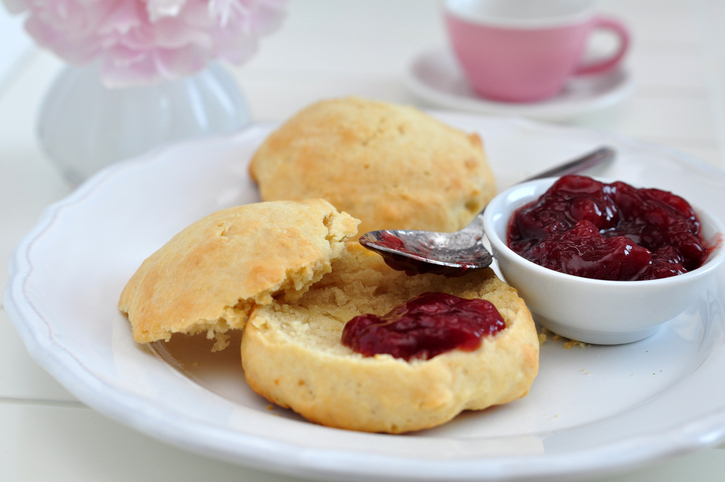 2Date scones — Add ½ cup chopped dates and 1 tablespoon caster sugar to plain or wholemeal scones mixture. 3Cheese scones — Follow the basic recipe substitute water for the milk and add 2/3 cup of grated tasty cheese to flour. Sprinkle a little paprika on top before baking.